This is the biggest feature of this phone. Oppo F9 Pro features VOOC Fast Charging in which you can get 2 Hour Talktime by charging only 5 minutes of the phone. This phone has a 3,500mAh battery. -The phone has a waterdrop screen, which means that the smartphone has a water drop display design. Earlier, the company's Oppo F9 smartphone was given a similar niche. -Mobile's screen to body ratio can be 90.8 percent. -Oppo F9 Pro will be the first mobile with the latest Gorilla Glass 6 protection, according to which this phone can hit 15 times from the height of 1 meter. -This smartphone will be available in three colors. Sunrise Red, Twilight Blue, and Stary Purple Color. -Oppo F9 Pro's primary camera will have an f / 1.9 aperture while the secondary camera will be used for depth sensing. - Oppo F9 Pro will be available with 6 GB RAM and 64 GB Rom. This is the biggest feature of this phone. 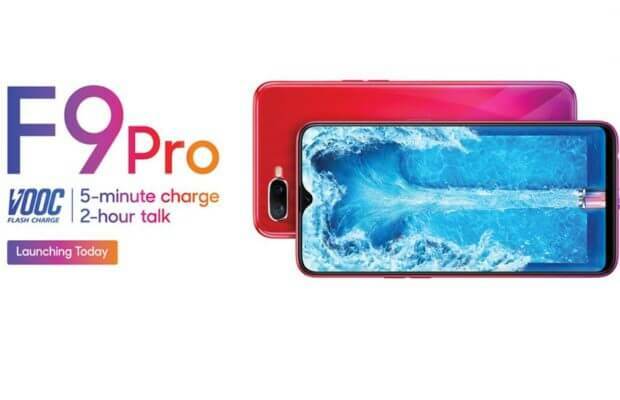 Oppo F9 Pro features VOOC Fast Charging in which you can get 2-hour talk time by charging only 5 minutes of the phone. This phone has a 3,500mAh battery. -This smartphone will be available in three colors Sunrise Red, Twilight Blue, and Stary Purple Color.